Sometimes ideas come from desire, other times they come from need. APRIL LOVE is the product of both. The initial idea was presented by Paul Austin for a take-apart portable that could be transported up a flight of stairs to a second floor area. After we agreed on size and options, April Love was born, named after his Daughter, but not without complications. It seems that something 8 feet long was not going to make it around the bend in the stairs, so back to the drawing board, and the "quad" design was developed. This is quite a unique little boat, because it can be many things to many people. First, and foremost, it is very transportable, with each module no larger than 4 feet long, 18 inches wide and 15 inches deep. Next it had to be a good boat to row, as this provides the simplest pleasures of boating. And then it had to be configured as a daysailer, to expand it's usefulness and fun factor. Finally, provision for a trolling motor was added to expand it's range. 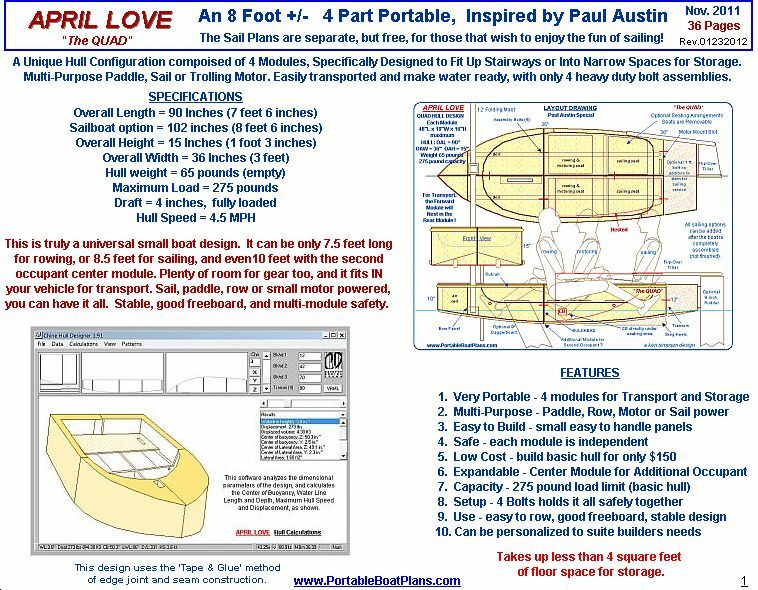 The end result is APRIL LOVE, an easy to build, easy to transport, safe and ample boat for everyday use. As can be seen in the drawing above, the size and form of APRIL LOVE are quite conventional. It is when you look at the details that you realize this is really simple complexity. 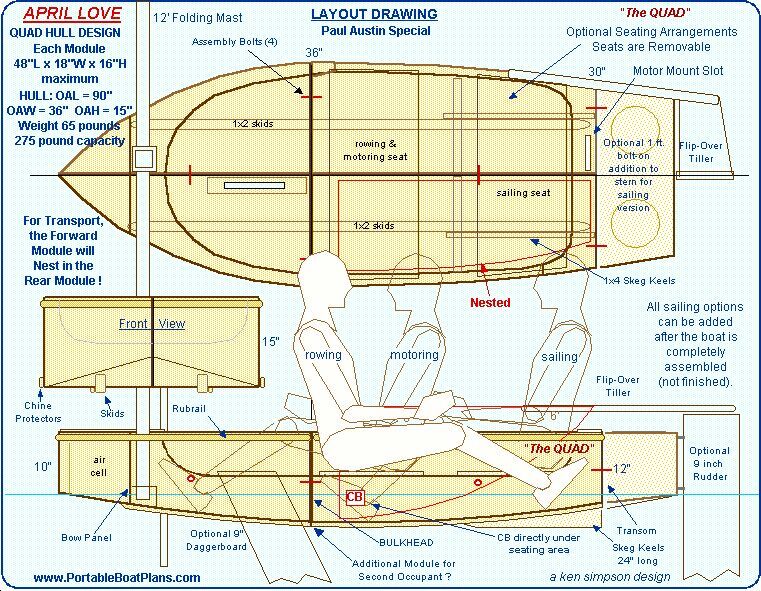 The Layout drawings below will further define the parameters of the design, and give some idea how the sailing option is configured. A review of the design would not be complete without an exploded view of the 4 modules. 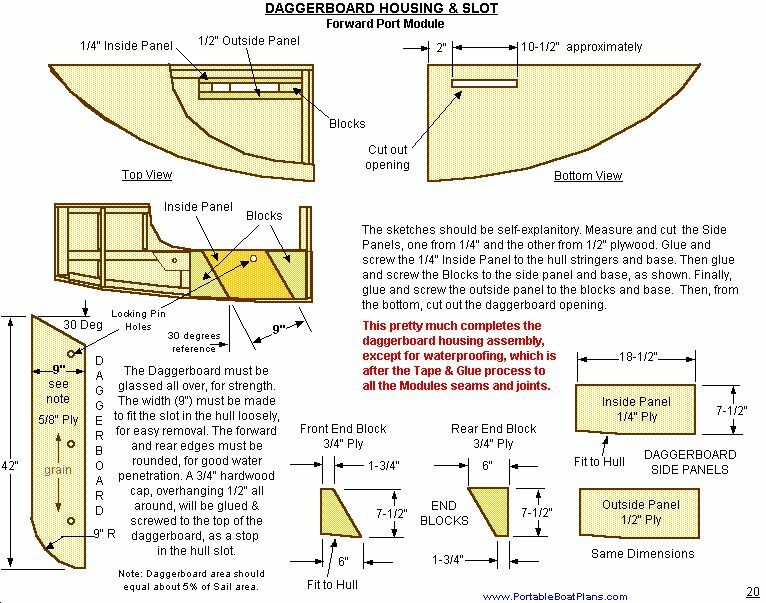 You will see that when bolted together, they develop a hull that is both strong, roomy and watertight. 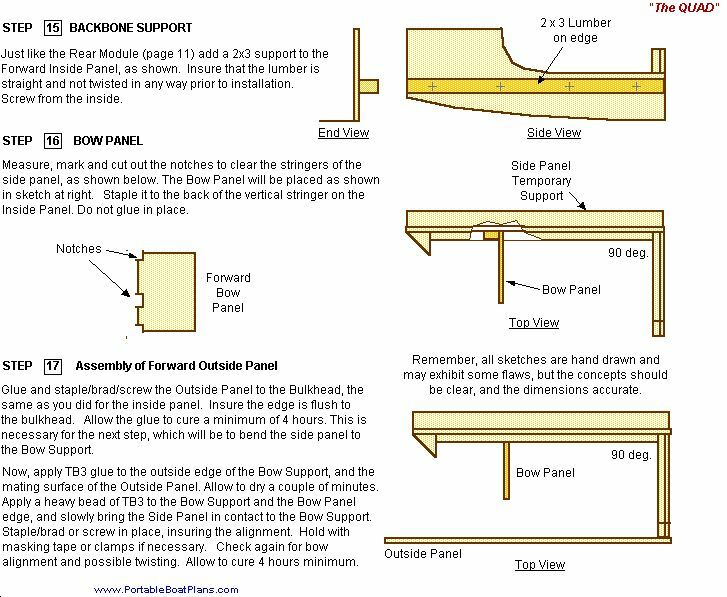 The following are pages taken from the assembly plans, and are intended to convey the relative ease of the construction methods. And a page from the Sail Plans. Finally, when photos of the finished boat become available, they will be posted here for your review. 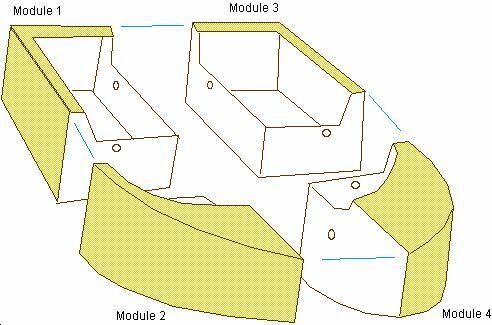 It should also be noted that for those that do not have a transport or storage problem, some hull modules can be glued and screwed together, in a variety of configurations, fore and aft, or side to side, for quicker assembly at the water. APRIL LOVE was obviously designed for a single occupant, but it can accomodate an adult and child for leisurely togetherness outings. Any questions you may have regarding the design will be responded to in a timely fashion. Plans are available now.